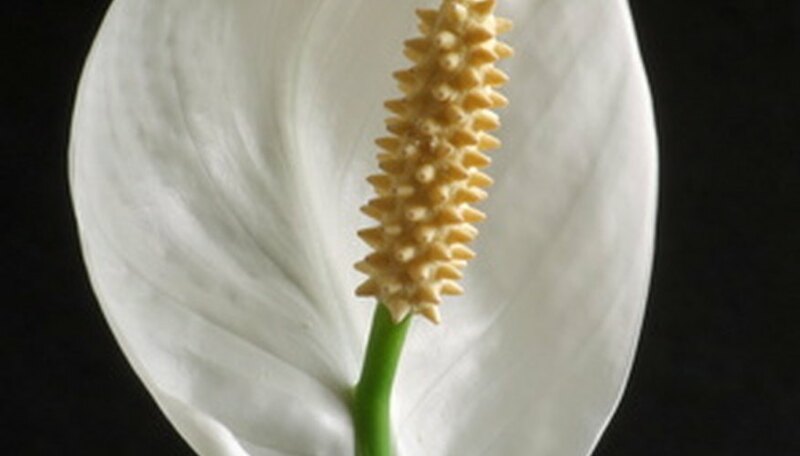 The prayer plant (Spathiphyllum, closet plant or peace lily) is a popular houseplant because it is considered easy to care for, lives for a long time in the right conditions and thrives in low-light situations. It is a tropical evergreen with broad leaves and produces flowers inside white shell-shaped bracts borne atop long stems. The prayer plant is often given as a sympathy gift and is commonly seen at funerals or memorial services. Although the prayer plant is capable of living in soil that is more moist than most houseplants, the roots will eventually rot if left sitting in waterlogged soil. The soil around the root system of the prayer plant needs small spaces for oxygen to reach the root system. Excessive moisture around the root system displaces the oxygen and causes the plant to wilt and begin to turn brown, especially around the leaf margins. The soil should remain evenly moist, but not wet, and the container should be well-drained. Too little moisture will cause the leaf margins, or edges of the leaves, to turn brown and become brittle. Growth of new leaves also suffers if the soil around the roots system remains dry. Prayer plants thrive in evenly moist soil in a well-drained container. Excess fertilizer is the most common reason for browning of leaf edges on a prayer plant. Too much nitrogen "burns" the leaf tips and margins. Excess fertilizer has the potential to accumulate in a container, causing damage to the plant. To prevent this from happening, flush out the soil by running water through it for a few minutes every three months. The correct way to fertilize a prayer plant is to prepare a mixture of one-half strength water-soluble fertilizer and fertilize after watering with clean water every 10 to 14 days. Too much light is another common reason for the leaves of the prayer plant to turn brown around the edges. This usually happens when combined with dry soil around the roots of the plant. Prayer plants cannot live in direct sunlight because their native habitat is the dense jungle. Bright light is acceptable, such as from an eastern or northern window, but direct sun will eventually affect the health and appearance of a prayer plant. Temperatures above 90 degrees Fahrenheit cause prayer plant to collapse or severely wilt. When this happens, it is difficult to bring them back without damage eventually showing up as browned leaf margins. Prayer plants grow best in temperatures between 65 and 80 F.